This article is about the Titan. For a collection of maps, see atlas. For other uses, see Atlas (disambiguation). In Greek mythology, Atlas (/ˈætləs/; Greek: Ἄτλας, Átlas) was a Titan condemned to hold up the celestial heavens for eternity after the Titanomachy. Atlas also plays a role in the myths of two of the greatest Greek heroes: Heracles (the Roman equivalent being Hercules) and Perseus. According to the ancient Greek poet Hesiod, Atlas stood at the ends of the earth in extreme west. Later, he became commonly identified with the Atlas Mountains in northwest Africa and was said to be "King of Mauretania". Atlas was said to have been skilled in philosophy, mathematics, and astronomy. In antiquity, he was credited with inventing the first celestial sphere. In some texts, he is even credited with the invention of astronomy itself. 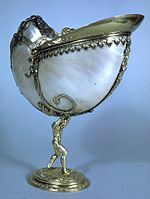 Atlas was the son of the Titan Iapetus and the Oceanid Asia or Clymene. He had many children, mostly daughters, the Hesperides, the Hyades, the Pleiades, and the nymph Calypso who lived on the island Ogygia. The term Atlas has been used to describe a collection of maps since the 16th century when Flemish geographer Gerardus Mercator published his work in honor of the mythological Titan. The "Atlantic Ocean" means "Sea of Atlas", while "Atlantis" means "island of Atlas", with some myths calling the deity a king of Atlantis. Atlas and his brother Menoetius sided with the Titans in their war against the Olympians, the Titanomachy. When the Titans were defeated, many of them (including Menoetius) were confined to Tartarus, but Zeus condemned Atlas to stand at the western edge of Gaia (the Earth) and hold up the sky on his shoulders. Thus, he was Atlas Telamon, "enduring Atlas," and became a doublet of Coeus, the embodiment of the celestial axis around which the heavens revolve. The greek poet Polyidus ca. 398 BC tells a tale of Atlas, then a shepherd, encountering Perseus who turned him to stone. Ovid later gives a more detailed account of the incident, combining it with the myth of Heracles. In this account Atlas is not a shepherd but a King. According to Ovid, Perseus arrives in Atlas' Kingdom and asks for shelter, declaring he is a son of Zeus. Atlas, fearful of a prophecy which warned of a son of Zeus stealing his golden apples from his orchard, refuses Perseus hospitality. In this account, Atlas is turned not just into stone by Perseus, but an entire mountain range: Atlas' head the peak, his shoulders ridges and his hair woods. The prophecy did not relate to Perseus stealing the golden apples but Heracles, another son of Zeus, and Perseus' great-grandson. One of the Twelve Labors of the hero Heracles was to fetch some of the golden apples which grow in Hera's garden, tended by Atlas' reputed daughters, the Hesperides which were also called the Atlantides, and guarded by the dragon Ladon. Heracles went to Atlas and offered to hold up the heavens while Atlas got the apples from his daughters. According to Plato, the first king of Atlantis was also named Atlas, but that Atlas was a son of Poseidon and the mortal woman Cleito. The works of Eusebius and Diodorus also give an Atlantean account of Atlas. 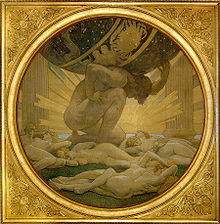 In these accounts, Atlas' father was Uranus and his mother was Gaia. His grandfather was Elium "King of Phoenicia" who lived in Byblos with his wife Beruth. Atlas was raised by his sister, Basilia. Atlas was also a legendary king of Mauretania, the land of the Mauri in antiquity roughly corresponding with modern Maghreb. In the 16th Century Gerardus Mercator put together the first collection of maps to be called an "Atlas" and devoted his book to the "King of Mauretania". Atlas became associated with Northwest Africa over time. He had been connected with the Hesperides, "Nymphs" which guarded the golden apples, and Gorgons both of which lived beyond Ocean in the extreme west of the world since Hesiod's Theogony. Diodorus and Palaephatus mention that the Gorgons lived in the Gorgades, islands in the Aethiopian Sea. The main island was called Cerna and modern day arguments have been advanced that these islands may correspond to Cape Verde due to Phoenician exploration. The Northwest Africa region emerged as the canonical home of the King via separate sources. In particular, according to Ovid, after Perseus turns Atlas into a mountain range, he flies over Aethiopia, the blood of Medusa's head giving rise to Libyan snakes. By the time of the Roman empire the habit of associating Atlas' home to a chain of mountains, the Atlas mountains, which were near Mauretania and Numidia, was firmly entrenched. The identifying name Aril is inscribed on two 5th-century BCE Etruscan bronze items, a mirror from Vulci and a ring from an unknown site. Both objects depict the encounter with Atlas of Hercle, the Etruscan Heracles, identified by the inscription; they represent rare instances where a figure from Greek mythology is imported into Etruscan mythology, but the name is not. The Etruscan name Aril is etymologically independent. According to Robert Graves' The Greek Myths, the Pelasgians believed the creator goddess Eurynome assigned Atlas and Phoebe to govern the moon. Atlas' best-known cultural association is in cartography. The first publisher to associate the Titan Atlas with a group of maps was the print-seller Antonio Lafreri, on the engraved title-page he applied to his ad hoc assemblages of maps, Tavole Moderne Di Geografia De La Maggior Parte Del Mondo Di Diversi Autori (1572); however, he did not use the word "Atlas" in the title of his work, an innovation of Gerardus Mercator, who dedicated his "atlas" specifically to honour the Titan, Atlas, King of Mauretania, a learned philosopher, mathematician, and astronomer. 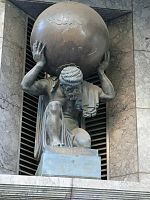 In psychology, Atlas is used metaphorically to describe the personality of someone whose childhood was characterized by excessive responsibilities. ^ a b Hesiod, Theogony 517–520. ^ Smith. "Atlas". Retrieved February 26, 2013. ^ Hesiod,Theogony 507. It is possible that the name Asia became preferred over Hesiod's Clymene to avoid confusion with what must be a different Oceanid named Clymene, who was mother of Phaethon by Helios in some accounts. ^ Homer, Odyssey, 1.14, 1.50. Calypso is sometimes referred to as Atlantis (Ατλαντίς), which means the daughter of Atlas, see the entry Ατλαντίς in Liddell & Scott, and also Hesiod, Theogony, 938. ^ Aeneid iv.247: "Atlantis duri" and other instances; see Robert W. Cruttwell, "Virgil, Aeneid, iv. 247: 'Atlantis Duri'" The Classical Review 59.1 (May 1945), p. 11. ^ George Doig, "Vergil's Art and the Greek Language" The Classical Journal 64.1 (October 1968, pp. 1-6) p. 2. ^ The usage in Virgil's maximum Atlas axem umero torquet stellis ardentibus aptum (Aeneid, iv.481f , cf vi.796f), combining poetic and parascientific images, is discussed in P. R. Hardie, "Atlas and Axis" The Classical Quarterly N.S. 33.1 (1983:220-228). ^ Ovid, Metamorphoses, IV.617ff (on-line English translation at Theoi Project). ^ William Godwin (1876). Lives of the Necromancers. London, F. J. Mason. p. 39. ^ A lost passage of Pindar quoted by Strabo (3.5.5) was the earliest reference in this context: "the pillars which Pindar calls the 'gates of Gades' when he asserts that they are the farthermost limits reached by Heracles"; the passage in Pindar has not been traced. ^ The "testimony of Eusebius" was "drawn from the most ancient historians" according to Mercator. Eusebius' Praeparatio evangelica gives accounts of Atlas that had been translated from the works of ancient Phoenician Sanchuniathon, the original sources for which predate the Trojan War (i.e. 13th century BCE). ^ See Bibliotheca historica, Book III, Eusebius' Praeparatio evangelica references the same mythology as Diodorus stating "These then are the principal heads of the theology held among the Atlanteans". ^ Paolo Martini, Il nome etrusco di Atlante, (Rome:Università di Roma) 1987 investigates the etymology of aril, rejecting a link to the verbal morpheme ar- ("support") in favor of a Phoenician etymon in an unattested possible form *'arrab(a), signifying "guarantor in a commercial transaction" with the connotation of "mediator", related to the Latin borrowing arillator, "middleman". This section and note depend on Rex Wallace's review of Martini in Language 65.1 (March 1989:187–188). ^ Graves, Robert (1992). The Greek Myths. Penguin Books. p. 27. ISBN 978-0140171990. ^ Homer, Odyssey 1.52; Apollodorus, E7.24. ^ Hyginus, Preface to Fabulae. ^ Ashley Baynton-Williams. "The 'Lafreri school' of Italian mapmakers". Retrieved February 26, 2013. ^ Vogel, L. Z.; Savva, Stavroula (1993-12-01). "Atlas personality". British Journal of Medical Psychology. 66 (4): 323–330. doi:10.1111/j.2044-8341.1993.tb01758.x. ISSN 2044-8341. Akerman, J. R. (1994). "Atlas, la genèse d'un titre". In Watelet, M. (ed.). Gerardi Mercatoris, Atlas Europae. Antwerp: Bibliothèque des Amis du Fonds Mercator. pp. 15–29. Gantz, T. (1993). Early Greek Myth: A Guide to Literary and Artistic Sources. Baltimore: Johns Hopkins University Press. ISBN 978-0-8018-4410-2. LCCN 92026010. OCLC 917033766. Grafton, A.; Most, G. W.; Settis, S., eds. (2010). The Classical Tradition (2013 ed.). Cambridge, Mass. : Harvard University Press. ISBN 978-0-674-07227-5. LCCN 2010019667. OCLC 957010841. Hornblower, S.; Spawforth, A.; Eidinow, E., eds. (2012). The Oxford Classical Dictionary (4th ed.). Oxford: Oxford University Press. ISBN 978-0-19-954556-8. LCCN 2012009579. OCLC 799019502. Keuning, J. (1947). "The History of an Atlas: Mercator. Hondius". Imago Mundi. 4 (1): 37–62. doi:10.1080/03085694708591880. ISSN 0308-5694. JSTOR 1149747. Lemprière, J. (1833). Anthon, C. (ed.). A Classical Dictionary. New York: G. & C. & H. Carvill [etc.] LCCN 31001224. OCLC 81170896. Ogden, D. (2008). Perseus (1st ed.). London ; New York: Routledge. ISBN 978-0-415-42724-1. LCCN 2007031552. OCLC 163604137. Ogden, D. (2013). Drakon: Dragon Myth and Serpent Cult in the Greek and Roman Worlds. Oxford: Oxford University Press. ISBN 978-0-19-955732-5. LCCN 2012277527. OCLC 799069191. Ramachandran, A. (2015). The Worldmakers: Global Imagining in Early Modern Europe. Chicago: University of Chicago Press. ISBN 978-0-226-28879-6. OCLC 930260324. Mercator, G.; Lessing J. Rosenwald Collection (Library of Congress) (2000). Karrow, R. W. (ed.). Atlas sive Cosmographicæ Meditationes de Fabrica Mundi et Fabricati Figura: Duisburg, 1595 (PDF). Translated by Sullivan, D. Oakland, CA: Octavo. ISBN 978-1-891788-26-0. LCCN map55000728. OCLC 48878698. Archived from the original (PDF) on 10 Mar 2016. Hesiod; Works and Days, in The Homeric Hymns and Homerica with an English Translation by Hugh G. Evelyn-White, Cambridge, Massachusetts., Harvard University Press; London, William Heinemann Ltd. 1914. Online version at the Perseus Digital Library. This page was last edited on 7 April 2019, at 06:28 (UTC).